On Tuesday right after I got out of work my friend Katie gave me a head's up that there were whales heading towards the lighthouse. I made a quick stop at home to pick up lunch and my camera bag and off I went! I got there just in time to see the first whales from J and K Pods heading slowly south against a strong flood tide at about 12:30 PM. The whales were super spread out, both north-sound and east-west, so they took a long time to pass by. 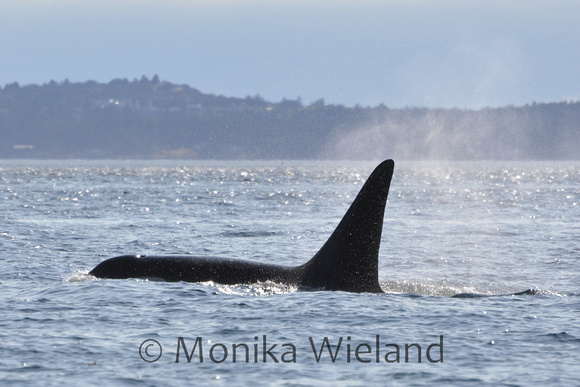 Some were way out in the middle of Haro Strait, but a few others were much closer to shore. 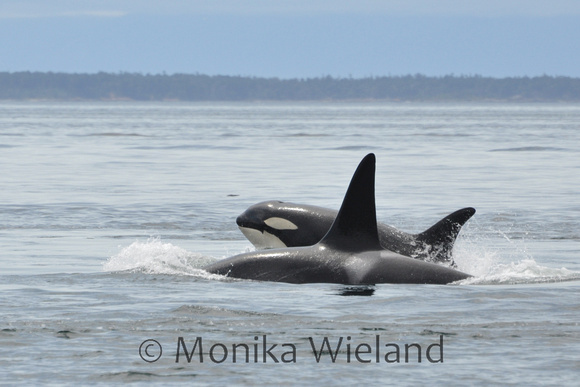 The groups I spotted closer to shore started with the K13s, K12s, and K14s. I'm not sure which whale this is, but she veered off and started heading right for the rock where I was sitting. As me and other onlookers waited for her to come to the surface again, I spotted her underwater, gliding by just off the kelp bed not 20 feet from where I was sitting. She surfaced just past me, continuing to head south. 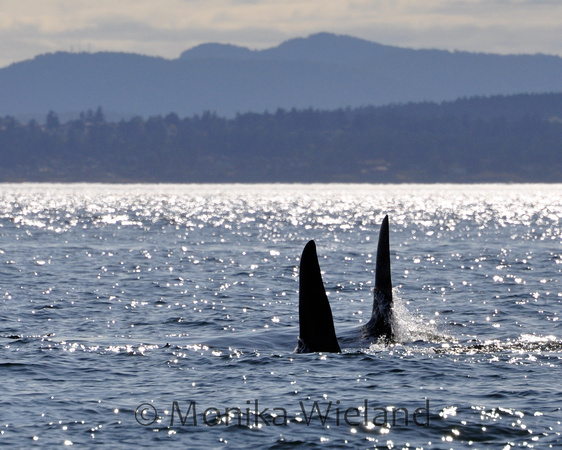 This full frame shot is uncropped - nothing in the world like being this close to a wild killer whale! Around 3:30 PM there were still whales to the north of us in addition to all those that had passed by heading south, but now they all started going every which way. Many whales went north again further offshore, but one group with lots of juveniles and calves just hung out in front of the lighthouse for a while. 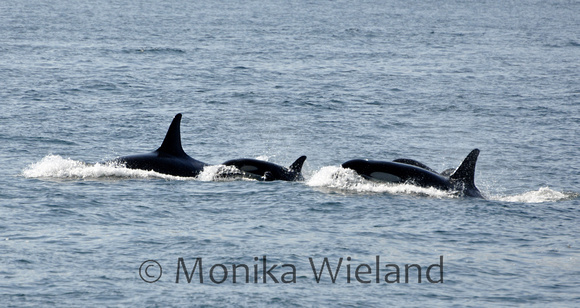 I found this moment especially touching - the two youngest K-Pod whales, from different matrilines, with their moms. All four of them surfaced together several times before veering a little offshore and playing for about 15 minutes. There were lulls between groups of whales passing, and I was very close to leaving after it looked like they had all gone north. I was even halfway up the hill when I turned around and saw a whale surfacing directly off from the lighthouse - so back down to the rocks I went. Sure enough, they all came back south again. It was well worth the wait, as around 5:30 the last big group of whales came by. Included in this group were a bunch of males - J27 Blackberry, J34 Doublestuf, L41 Mega, L79 Skana, L87 Onyx, and at least one other. It was hard to count whales when they were as spread out as they were, but I saw or identified in my photos whales from every family group in J-Pod and K-Pod plus the L12 subgroup of L-Pod, so there were probably about 60 whales out there! 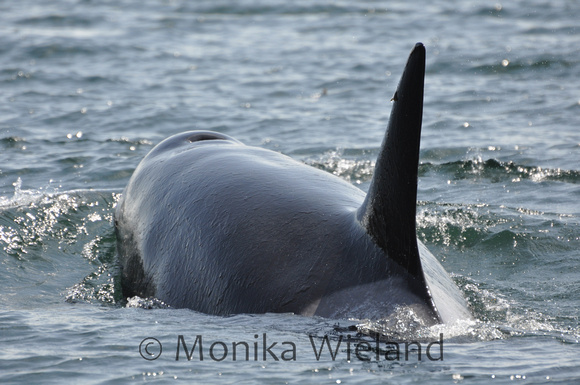 The males were having a very good time together, tail slapping, rolling at the surface, and swimming upside down. They were clearly enjoying themselves, as I saw several "sea snakes" (orca penises) extended. 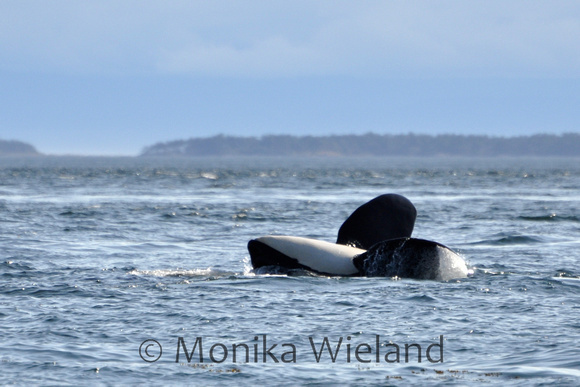 It's not unusual for orcas, or other species of dolphin, to engage in sexual behavior for fun rather than just for breeding, and that includes sexual behavior among individuals of the same gender which is definitely what was going on that evening! I was on the west side for five and a half hours, with whales in sight the entire time I was there - definitely a whale of an afternoon! It reminds me of some of the epic passbys we had during some of my first summers here, where a superpod would just go back and forth on the westside for hours at a time. A photo gallery of all the photos in this blog post can be seen here, where any of them can be ordered as prints. Wow! What an incredible photo shoot! I am so thrilled that you had such a great afternoon on Tuesday. Wish I could have shared it all with you. And great photos, as usual. OMG, I almost feel like I'm there with you. I LOVE seeing your photos. 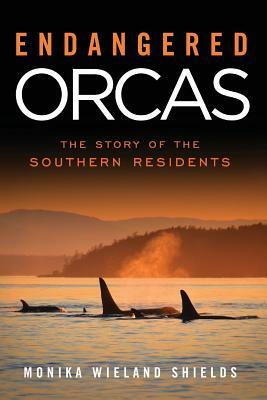 I've always loved orcas but I've never imagined getting to see them as frequently and as close as you do. I am in such love with following your blog and seeing your pictures. As a native from the Puget Sound, now transplanted in the south, I find myself missing the northwest waters when I see your pics. But I well remember the chill and the rain and the reasons why I left. Still, it's something to get to enjoy vicariously through you. As always, thanks for sharing! Lois - It was indeed an incredible afternoon! Jessica - Thanks so much for taking the time to comment. I'm always thrilled to hear from people who are enjoying my blog. 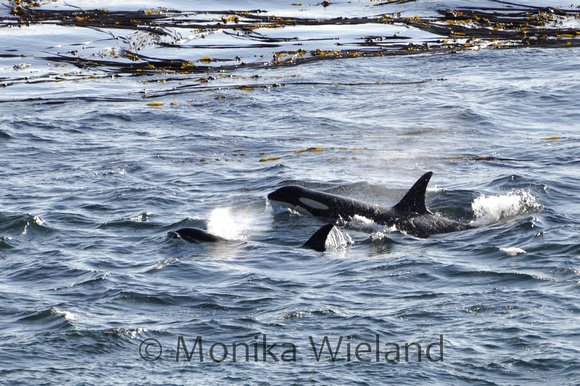 I try to never take for granted being able to see the orcas as much as I do! I'm glad I'm able to share with you some photos of the northwest! Dave - Awesome definitely describes that afternoon as well! Purple patch? Am I missing something? wow... you got some awesome shots! We are going out on Sunday and hope to find a pod or two. I don't visit your blog as often as I'd like, but when I do... I'm never disappointed! Wow! It looks like you had a great time. Love the photos.